I didn’t bother to read the article though, I just jumped right in to trying to duplicate some of the exercises shown in the pictures. I did a lot more falling than balancing… It some how wasn’t as easy as I thought it would be. What should come as no great surprise is that it didn’t go very well and my first hand balancing escapade ended in frustration after less than a half-hour. As I mentioned earlier, my initial interest in hand balancing was basically just to show off — and it’s a pretty good way to do so — but if you take a look back through the history of strength training you’ll notice something else about it that stands out. Many of the oldtime strength athletes used hand balancing as a way to build incredible strength and upper body development. The list of strength athletes who were also great hand balancers reads like a “who’s who” of legends: Sig Klein, John Grimek, Doug Hepburn, Paul Anderson, Jack LaLanne, Bert Assirati, George F. Jowett, Steve Reeves, Otto Arco, Bert Goodrich and Clevio Massimo… just to name a few that come immediately to mind. It took a little while, a few decades, in fact, but eventually my interest in hand balancing came back in a big way. 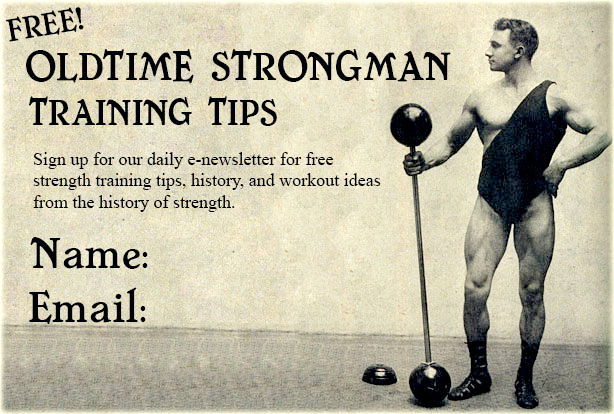 There were several factors which contributed to this: first of all, I got really interested in improving my overhead press, and hand balancing is one of the “lost” methods that the oldtime lifters used to use for doing so. The Basic Hand Stand: All other skills can only be accomplished by mastering this movement. Not bad for a former nose guard with zero previous gymnastic experience! If you’d have seen me when I started you would never have thought this was even possible. Staggered Balancing: Another challenge is to hold a balance with your hands at different heights. One of the most popular methods of doing this is using a common kitchen chair but you can learn to do it just about anywhere. The “Figure Four”: Once you get pretty good at the basic hand stand, you can move on to more challenging skills. This intermediate move is called “The Figure Four” since the body looks like a “4” when viewed from the side. You’ll find it discussed in detail on page 41. Narrow Balancing: Adjusting the width of your base is another way to work on different skills. Look closely and you’ll see that my thumbs are touching, a surprisingly difficult balance. If you want to improve your overhead press, this movement builds tremendous shoulder strength and stability. You wouldn’t have read this far if you didn’t mean business… It took roughly two decades between the time I first got interested in hand balancing to the time I was actually able to accomplish it but I could have condensed that down to only a few weeks if I knew the right place to begin…When I started, I had the desire and the motivation, but I lacked the know-how. Today, the know-how is now right in front of your face. I can only dream of where I might be if I had Bill Hinbern’s course way back in the day. You have a chance to not just get started, but to get started at the best possible place and know exactly what you should be doing. It is like the difference between taking the long, slow, frustrating road which may or may not get you to where you want to go… or, on the other hand, you can take a straight-line “shortcut” right to the top. Yes, there will be work involved, there’s no way around that, but there sure won’t be any more work than what is necessary… Hey, if I can learn to do this, anyone can, take the plunge and order your copy of Hand-Balancing for Muscular Development right now and maybe one day you will run off and join the circus! Hand-Balancing for Muscular Development by Bill Hinbern is a paper and ink printed course and is not available in e-book format. The course is paperback, consiste of 72 pages, profusely illustrated with dozens of rare pen and ink drawings and has a heavy-stock cover. An Anatomy chart, kilo to pounds conversion table and full list of resources are also included. The contents and topics covered in this course can be found else where on this page.